In total I got 17 sugary mind blowers (incl. the end pieces which are not so pretty but taste heavenly) of one batch of the dough. Warm the milk up to 42 C (so that the yeast will activate). Then, dissolve yeast in warm milk in a large bowl. Add sugar, butter, salt, eggs, and flour. Mix well. 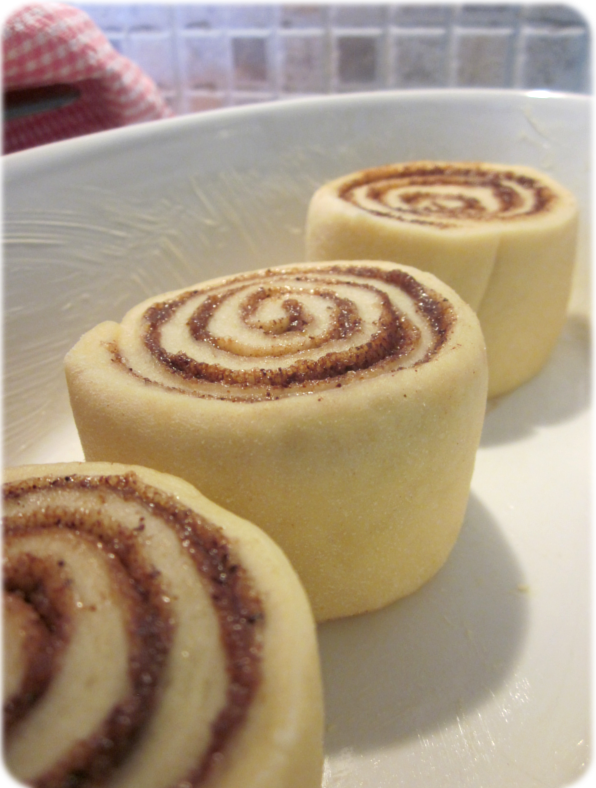 Dust your hands lightly with flour and then hand knead the cinnamon roll dough into a large ball. Put the ball of dough into a bowl and cover the bowl with plastic wrap or linen cloth and let rise in a warm place for roughly 1 hour or until dough has doubled in size. Once your dough has risen, it’s time to move on to the next step. In a new, small bowl, combine brown sugar, cinnamon, and butter. Mix them well. 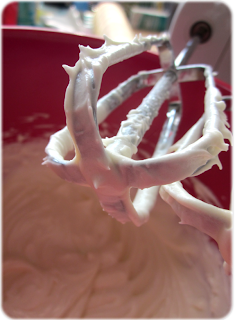 Spray a flat surface with cooking spray or sprinkled flour. Roll out your dough ball into a rectangle roughly 1/4 inches (0.6 cm) thick then spread a 1/4 cup of softened butter on the dough. Next, sprinkle the rolled, buttered dough evenly with the sugar/cinnamon/butter mixture you prepared in your small bowl. 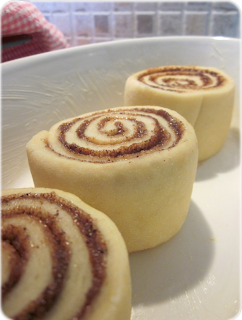 Roll up the dough starting with the longer side and cut into fourteen (14) cinnamon rolls (or smaller rolls, if you prefer). I cut about 1.6” (4 cm) long pieces. 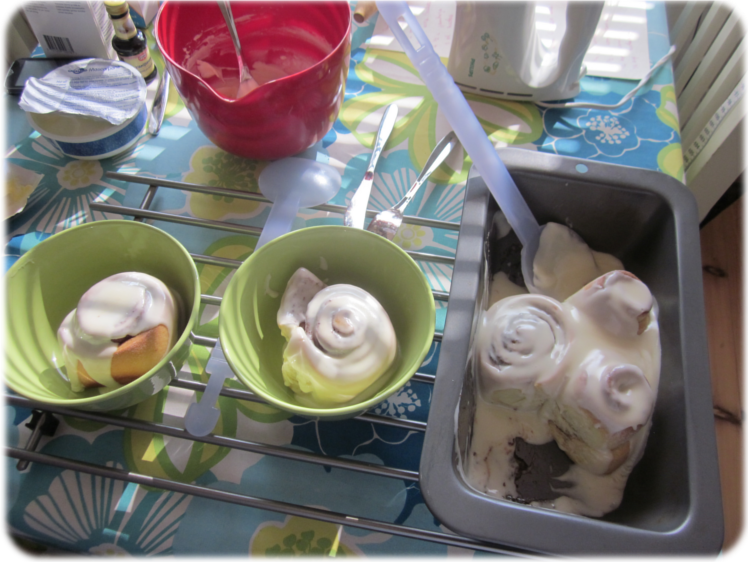 Place the cinnamon rolls in a lightly greased glass baking dish. 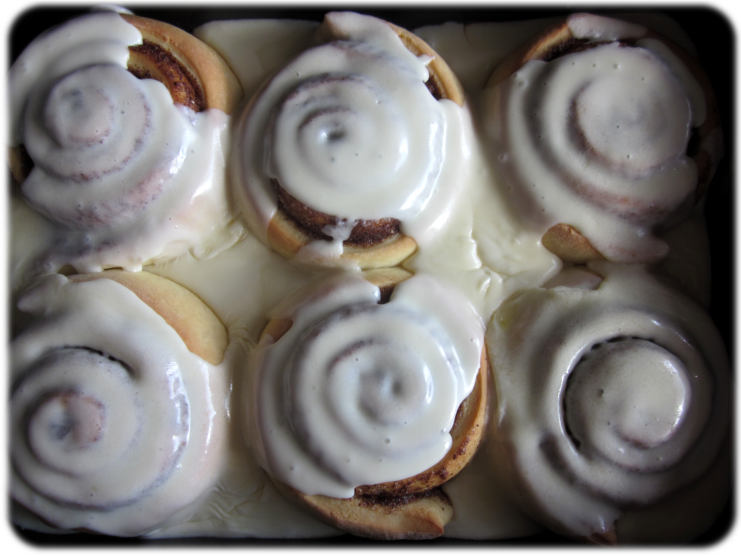 Cover the dish with aluminum foil and let the cinnamon rolls rise until nearly doubled, which should take around 30 minutes. Preheat oven to 350 F (175 C). Once your cinnamon rolls have risen, bake them in the preheated oven until golden brown, approximately 18 to 20. The ones I put in a metal baking pan I baked about 17 minutes. The dough should still be soft, though fully cooked, especially toward the center of the rolls. But I think it’s best to make a test batch first since all ovens are a bit different.